Gargrave is a small pretty village situated on the very edge of the Yorkshire Dales in North Yorkshire and just outside the Yorkshire Dales National Park. With the Pennine Way, the River Aire and the Leeds and Liverpool Canal passing through the village it is popular with hikers, cyclists and bargees. East Marton is a small village situated on the A59 with the Leeds and Liverpool Canal passing through on the east side of the village on its descent from Foulridge to Leeds. South of East Marton the towpath leads onto the Pennine Way. The River Aire is a major river flowing for 71 miles rising at Malham Tarn flowing underground to Aire Head and after passing through Gargrave and Skipton it flows through West Yorkshire and eventually through Leeds before it enters the River Ouse at Airmyn in the East Riding of Yorkshire. Part of the river is canalised and is known as the Aire and Calder Navigation. The Leeds and Liverpool Canal runs for a distance of over 127 miles, crossing the Pennines, linking the two cities. 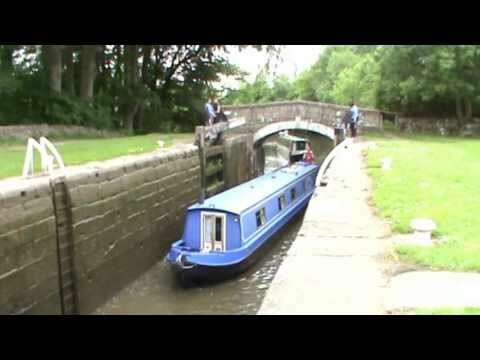 The canal said to be the longest single canal in England has 91 locks on the main line. It has several small branches and in the early 21st century a new link was constructed into the Liverpool docks system. Construction began in 1770 and took almost 40 years to complete. James Brindley was appointed chief engineer and John Longbotham clerk of works but following the death of Brindley in 1772 Longbotham carried out both roles. The most important cargo was always coal with over a million tons per year being delivered to Liverpool in the 1860’s. Once the canal was fully open receipts for carrying merchandise nearly matched those of coal and with heavy industry along its route and the decision to build the canal with broad locks ensured the canal could compete successfully with the railways throughout the 19th century and remained open through the 20th century. We park on the corner opposite the church and head down the road towards the station taking the Pennine Way on the right. We go over the stile in the wall on the left and turn right following the path through the fields uphill. At the top left hand corner we go through the gate turn left and cross over the railway line then follow the track. We cross over a cattle grid and go over the stile opposite into a field where we turn slightly right and head uphill to a sign post. We keep heading forwards we can see a mast in the distance. We pass Newton Grange on our right and keep following the fence line. We then cross over the little beck at the bridge on the right then head forwards over the field with a building on our left. We come to a gate we go through turn left then right over the bridge and follow the track for a short way. We then take the footpath on the left sign posted East Marton ½ mile over the field and through the wood opposite for a very short way and go over the stile into the next field. At the road we turn left and follow the road to go over the canal at Williamson Bridge. We pass Abbots Harbour licensed restaurant and cafe, then uphill to the Cross Keys pub on the A59. We cross the A59 taking the footpath signposted Tow Path ¼ mile and head over the field to cross a stile in the fence and bear left to the bridge over the canal. We now follow the tow path alongside the canal all the way back to Gargrave coming out on the A65 where we turn right and follow the road on the pavement back into Gargrave centre and our car park. This is an easy flat walk through the fields to East Marton and return following the Leeds and Liverpool Canal. Only a few slight inclines and declines. There’s a small section of minor road and a small section of the A65. Elevation: approx lowest point 110m (306 ft) approx highest point 157m (516 ft). Approx 7.3 miles allow 2 hours 40 minutes using OS map Explorer OL2 Yorkshire Dales, Southern and Western areas. Start Point: opposite the Church of St. Andrew on Church Street. Gargrave is situated on the A65 between Skipton and Settle. From the A1(M) take the A59 through Knaresborough and Harrogate towards Skipton. At the roundabout just before Skipton take the A65 towards Settle. Gargrave is approx 12 miles from Skipton. There is a free car park in North Street, some road side parking and a few spaces opposite the church. There are public toilets in the centre of Gargrave and for refreshments in Gargrave there are a variety of shops, cafes, take away and three pubs the Anchor Inn, the Masons Arms and the Old Swan. Next to the canal near East Marton there is the Abbots Harbour licensed restaurant and cafe and a pub the Cross Keys.